[First published 21/05/2015; re-posted with additional remarks]. Cambodia went to war with Thailand a couple of times over the Preah Vihear-related territorial issue, in addition to asking the ICJ to review the underlying legal wrangle that underpinned the conflict between the two countries since 2008. 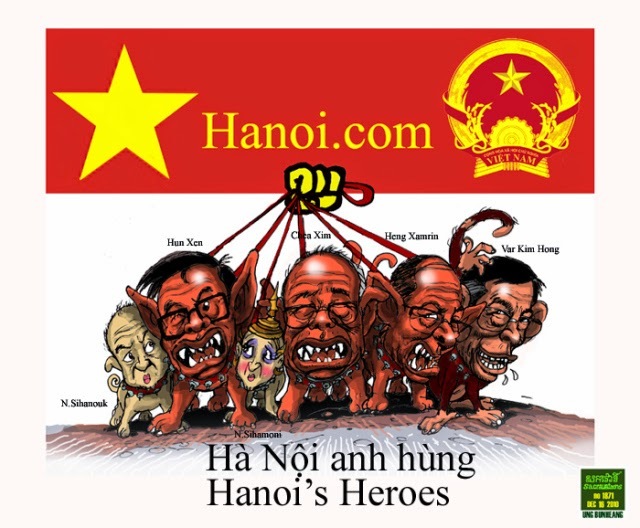 Yet, not once since the Vietnamese invasion of Cambodia in 1979 has the Hanoi-installed Phnom Penh regime made any serious effort to resolve the perennial issue of Vietnam's land encroachments along the border in the east. Va Kim Hong [the regime's expert on border affairs] is known to have expressed preference for a policy of shearing chunks of one's flesh off [Cambodia's territory] to feed and satisfy the tiger [Vietnam]. Ke Kim Yan [former RCAF chief] was unceremoniously stripped off his army post for having detailed a series of territorial infringements by Vietnam along the border in an otherwise obligatory routine report expected of his duty as a soldier. The 'leaked' charge or allegation made against Kim Yan was that he was removed from his post due to the vast personal land deals he had accumulated in his name. But if the charge of abuse of one’s position and power, and of massive corruption constituted the real reason behind his demotion, then he was hardly an exception out of all his CPP colleagues holding powerful positions in the military or elsewhere. After more than 70 years as monarch of Thailand, King Bhumibol Adulyadej’s reign has come to an end. Bhumibol, the longest-reigning monarch in the world, held a demigod-like status in Thailand, with well-wishers gathering outside Bangkok’s Siriraj Hospital in recent days to pray for his recovery. Many observers believe his death is likely to throw the country into turmoil. Maha Vajiralongkorn, the Crown Prince of Thailand and heir to the throne, is a controversial figure and, for some, an unsuitable ruler.